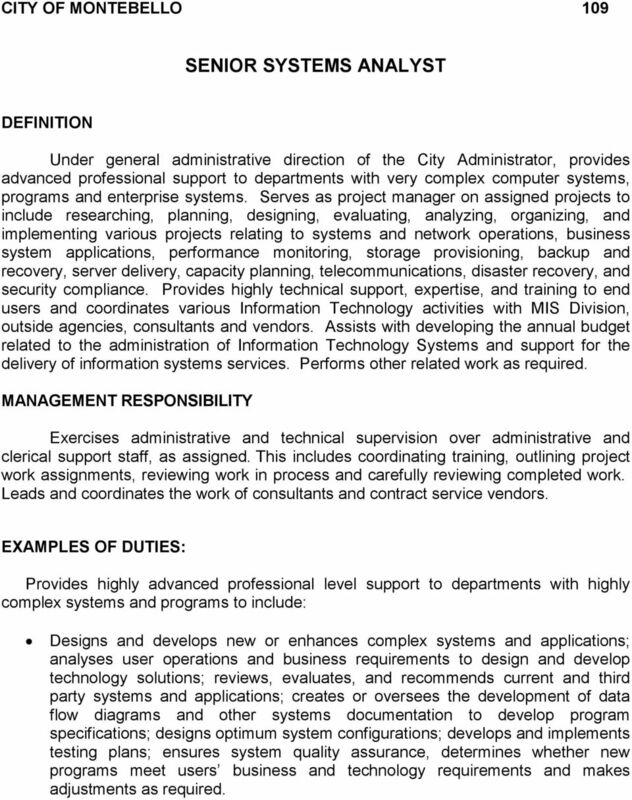 1 CITY OF MONTEBELLO 109 DEFINITION Under general administrative direction of the City Administrator, provides advanced professional support to departments with very complex computer systems, programs and enterprise systems. Serves as project manager on assigned projects to include researching, planning, designing, evaluating, analyzing, organizing, and implementing various projects relating to systems and network operations, business system applications, performance monitoring, storage provisioning, backup and recovery, server delivery, capacity planning, telecommunications, disaster recovery, and security compliance. Provides highly technical support, expertise, and training to end users and coordinates various Information Technology activities with MIS Division, outside agencies, consultants and vendors. Assists with developing the annual budget related to the administration of Information Technology Systems and support for the delivery of information systems services. Performs other related work as required. MANAGEMENT RESPONSIBILITY Exercises administrative and technical supervision over administrative and clerical support staff, as assigned. This includes coordinating training, outlining project work assignments, reviewing work in process and carefully reviewing completed work. Leads and coordinates the work of consultants and contract service vendors. EXAMPLES OF DUTIES: Provides highly advanced professional level support to departments with highly complex systems and programs to include: Designs and develops new or enhances complex systems and applications; analyses user operations and business requirements to design and develop technology solutions; reviews, evaluates, and recommends current and third party systems and applications; creates or oversees the development of data flow diagrams and other systems documentation to develop program specifications; designs optimum system configurations; develops and implements testing plans; ensures system quality assurance, determines whether new programs meet users business and technology requirements and makes adjustments as required. 3 3 EXAMPLE OF DUTIES (cont.) project team; selects and monitors contractors for outside services when required for a program; develops written reports and presentations on project status. Negotiates and prepares various contracts for the purchase, lease, and maintenance of various software/hardware systems for the agency. Assists with developing the annual information technology operating budget and forecasts funds needed for staffing, equipment, materials and supplies; controls, monitors, and reports budget expenditures; and recommends necessary adjustments to the budget. Makes presentations on alternatives and recommendations of plans and solutions for agency IT activities. Performs other duties as assigned. EMPLOYMENT STANDARDS Knowledge of: Microsoft Operating Systems and Application Servers: Windows Servers Edition, Exchange 2010; Microsoft SQL Server 2008 Enterprise, Active Directory, and Office Suite; Linux Operating System; Enterprise VMware Virtual Infrastructure and VMware Virtual Desktop Implementation; Networking Infrastructure Design and Implementation; Enterprise level networking components such as tiered level firewall systems, L3 routers, Smart switches, access points and controllers, web filtering systems, SMTP gateway, VPN concentrator, and VMware View remote access; Tiered Storage Area Network backup system and cloud backup system; Quality Assurance methods and recent developments in hardware and software; Operations, services, and activities of a comprehensive information systems program; Principles and practices of project management; Highly complex principles, practices, and methods of system design, development, analysis, testing, security administration, backup, and contingency/disaster planning; Methods and techniques of resolving highly complex network system compatibility and integration issues; Operational characteristics of a variety of database systems, tools and utilities; Other principles, concepts, practices and techniques of management information systems. 4 4 EMPLOYMENT STANDARDS (cont.) Ability to: Plan, organize and review the work of others; Communicate effectively, both orally and in writing; Analyze administrative and budgetary problems, identify solutions, identify project consequences of proposed actions, recommend best options and implement recommendations in support of goals; Prioritize work processes and projects; Plan, develop, and implement projects and programs; Manage projects effectively by delivering information technology projects on-time and within budget; Research and interpret complex technical information; Research, analyze and evaluate new service delivery methods and techniques; Analyze and document business processes; Research, analyze and evaluate new computer system methods, applications, procedures and techniques; Evaluate and select systems hardware and software systems; Participate in the development and administration of division goals, objectives and procedures; Prepare and present effective presentations; Work collaboratively in a team environment. Establish and maintain effective and cooperative working relationships with City employees and the general public; Use initiative and independent judgment within established guidelines; Provide effective customer service. Education and Experience: Any combination of education and experience that would likely provide the required knowledge, skills and abilities may be qualifying. A typical way to obtain the knowledge, skills, and abilities would be: Education: Graduation from an accredited college or university with a Bachelor's degree in Computer Science, Information Systems or a closely related field. 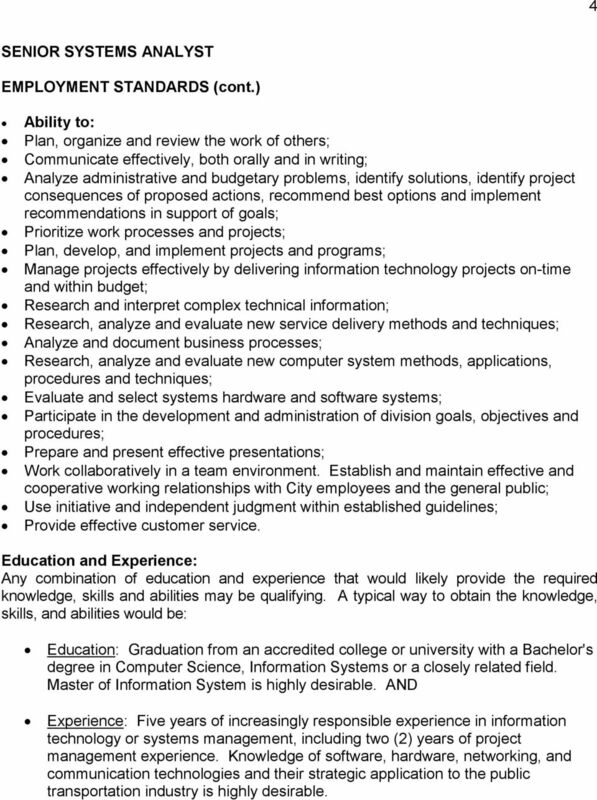 Master of Information System is highly desirable. AND Experience: Five years of increasingly responsible experience in information technology or systems management, including two (2) years of project management experience. Knowledge of software, hardware, networking, and communication technologies and their strategic application to the public transportation industry is highly desirable. Information Pack. Network Administrator. Thank you for your interest in applying for the position Network Administrator with the City of Ballarat. Information Pack Network Administrator Thank you for your interest in applying for the position Network Administrator with the City of Ballarat. 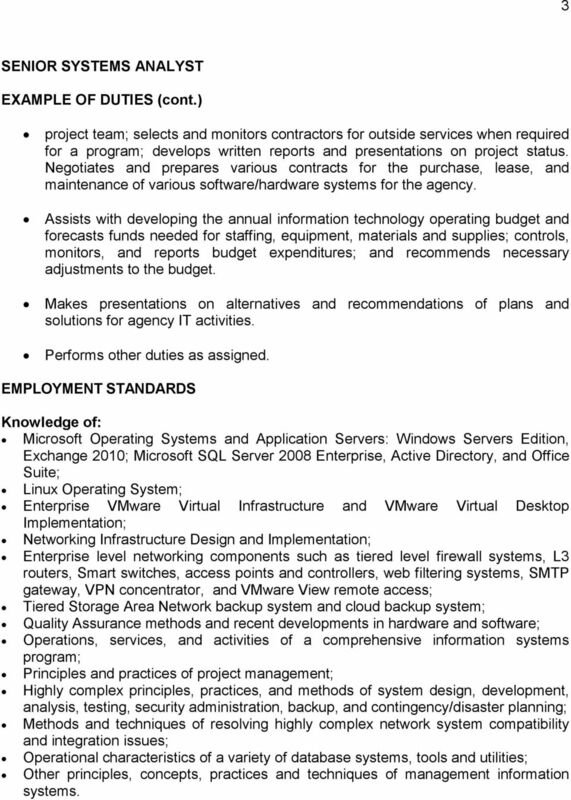 Please find enclosed an information package for the position. Position Type: Risk: The Technical Support Officer role is a broad banded position covering Grade 5 to Grade 10. Leads organization s IT disaster recovery and business resumption planning, testing, and implementation pertaining to computing infrastructure. 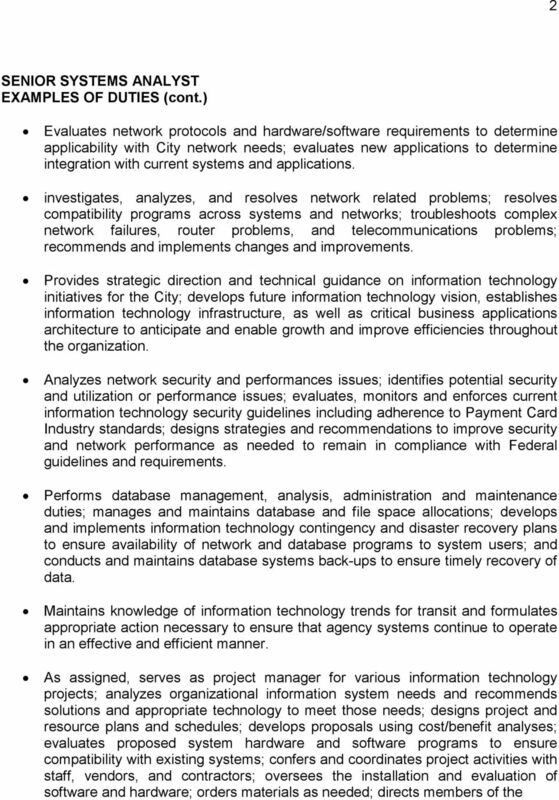 Managed Network Services RFP. Q&A Document. Q1: What types of hardware does Clark County Department of Job & Family Services (CCDJFS) currently have?